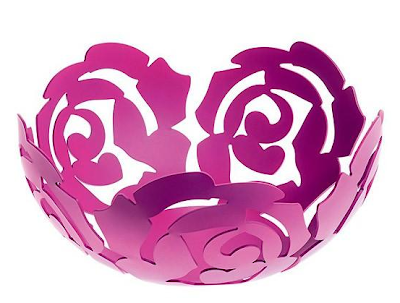 I'm loving the La Rosa Fruit Bowl by Alessi. This fruit bowl uses the rose as its motif – a symbol of femininity, grace, and love. This would look pretty on my mirrored buffet. I love the pop of color! 4 Responses to "SMALL SPACE ACCENTS: La Rosa Fruit Bowl"
That is such a cute ornament! I have a photo frame with a very similar cut out pink rose design, this would make a perfect addition to my dress table to display jewellery.